(Updated at 11 pm) The Hurricane Hunters are inside what is winding down to be a ragged Bertha. Numerous flights and surface observations showed there was a VERY lopsided wind field throughout the day as Bertha passed in between Martinique and Dominica. There was a west wind on the island of Martinique as it passed that island. Currently, there are some very weak winds from the west, which suggests that Bertha’s circulation is eroding. We’ve now got the opposite problem than what we had up to this point: decent convection, but no closed center. 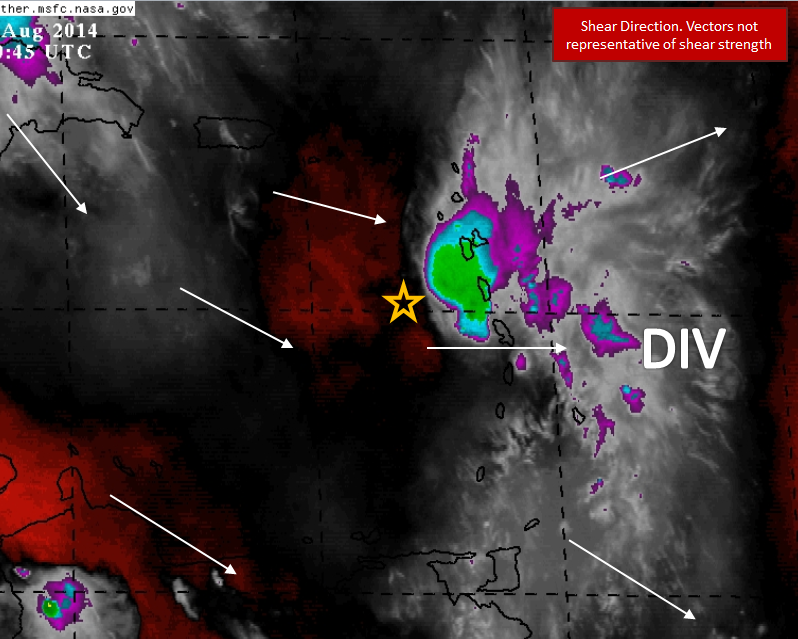 Why is Bertha Opening Up Into A Tropical Wave? Shear is now changing direction. Up until now 93L and Bertha had to deal with winds coming from the Atlantic, but now we have winds coming from the Caribbean or from the west. Dry air still remains a problem on the western side. This is removing thunderstorms to the eastern and northern side…away from the center of circulation. This should be temporary in the Caribbean as Bertha moves to the WNW/NW toward the Greater Antilles. Why is there now so much convection associated with Bertha? A new area of divergence has been created as an outflow channel is setting up the east of the center. Warmer water temperatures are also helping. As always, consult the NHC for official information! Winds: up to 50 mph in the tropical storm warning listed above on Saturday in Puerto Rico, the DR, and much of the northern Lesser Antilles. Gusty conditions at times. Gusty conditions in the Bahamas and the Turks and Caicos may begin early Sunday. Rainfall: 1-3″ for the Lesser Antilles tonight into Saturday, coming to an end from east to west. Higher amounts up to 6″ are possible in the mountains. 2-5″ of rainfall is likely on the islands of Puerto Rico and Hispaniola through Sunday as the system moves by. Ever so slight changes in steering flow will likely say whether Bertha goes over Puerto Rico, the Mona Passage, or the big bump – Hispaniola. Models are indicating that this change is small, but changes in intensity may also change that forward direction. Remember TD 2? It went west in the same flow that Bertha is now in, but Bertha is stronger and is following a slightly different mean flow. I should mention at this point that you might be getting confused by shear and mean flow. Shear is a difference in wind between two different heights, and mean flow is the general direction of flow through a depth of the atmosphere. Shear likely won’t change the direction of this storm in this case since it is a change in speed rather than direction. One thing that does give forecasters confidence in the WNW to NW forward direction is that mean flow throughout the atmosphere up to the upper levels is toward the WNW. 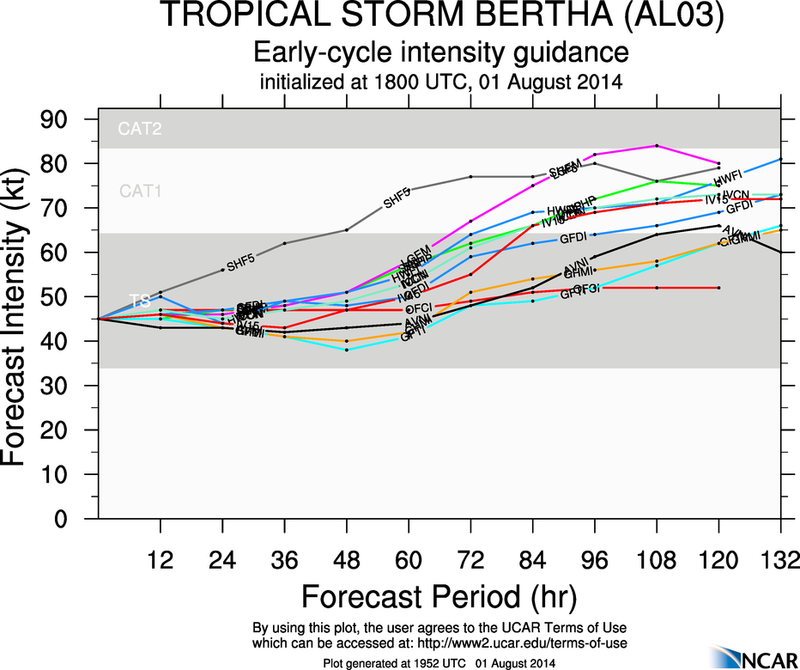 Like I said, only minor changes in the exact path may change the intensity of Bertha pretty quickly. In other words, if Bertha runs aground in Hispaniola, the terrain of the Dominican Republic and its friction will slow down the winds at the surface and tear apart any circulation that may still exist. Chances are much better for intensification in the Atlantic if Bertha does not hit the DR. Dissipation because of shear and dry air or Hispaniola are distinct possibilities between now and Sunday Morning. Either way, models tend to show an increase in intensity early next week in the Atlantic. Now that Bertha is slightly weaker and lesser organized, we begin to go through the early stages of formation again. That means that reformations are very possible until organization ticks up. Reformations could take place at any time as new swirls form and intensify. Usually old centers fade away, but not always. 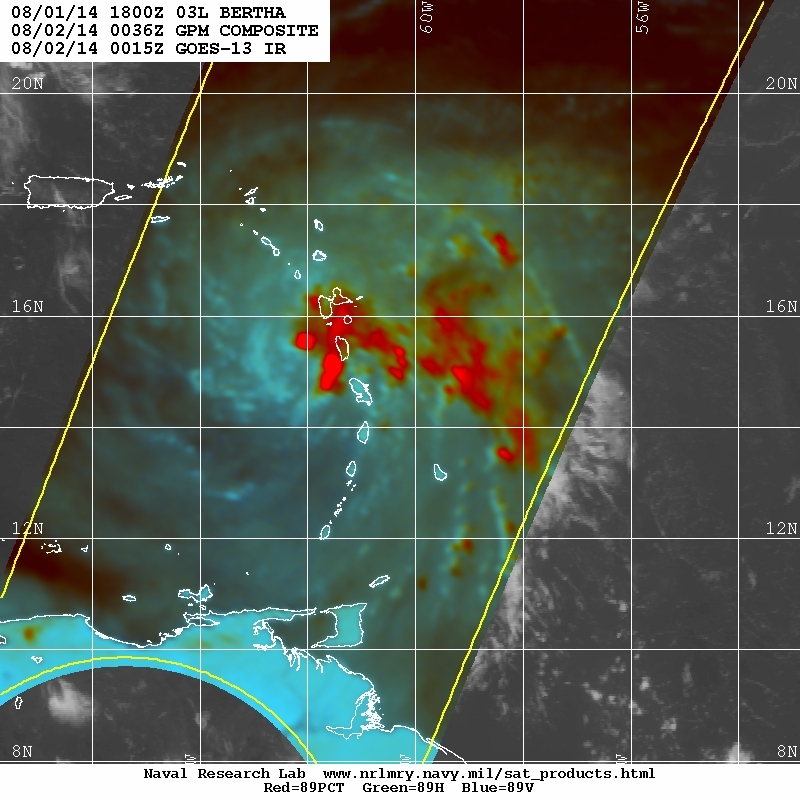 Roughly 2 hours ago, the following GPM microwave image showed some lower level structure in Bertha in blue, suggesting there is still a low level center. I will make some updates when the 11pm NHC advisory comes out, so check in here after you check http://www.hurricanes.gov for official information. For more frequent information, find me @JonathanBelles. Thanks for reading! Posted on Friday, August 1st, 2014, in Tropical Weather. Bookmark the permalink. Leave a comment.